The light blue stole we have with white trim is a sensational option that will really bring your outfit together. With your graduation just around the corner, now is the best time to start getting your graduation attire together. You have put in countless hours and given your maximum effort over the last few years. At Honors Graduation we know how hard you have been working and how hectic this time of your life can be. That is why we have made it easier than ever to get all of your gear in time your your ceremony. With a little help from the pros over at Honors Graduation, you will look astonishing for your big day. We have all the essentials that you will need plus so much more! Traditionally, graduating students dress in a graduation cap and gown for their ceremony but it is not uncommon for them to also accent their wardrobe in various ways. At Honors Graduation, in addition to our convenient package deals including your robe & cap, we have customizable graduation accessories as well. Show your involvement with your club or your support for your school with one of our many graduation stoles. At Honors Graduation we have a few different options when it comes to the style of your graduation stole. 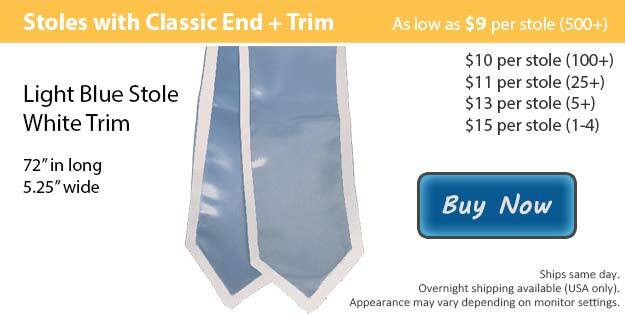 For the finish of your stole we have the classic cut or we have an angled cut. Our stoles are available with or without the contrasting trim, for a single colored stole. We have over 15 color choices for our graduation stoles, allowing you to pick the best colors to represent yourself. If you wish to personalize your graduation stole, our customization team can add an image or the wording of your choice using embroidery. Afterwards, our stoles make for a great memento that you can hang on display as a reminder of all the hard work you put in and how far you have come.